The ancient greek settlers established the first wine making vineyards some 2500 years ago on the islands of the Dalmatian coast: Hvar, Vis and Korčula. 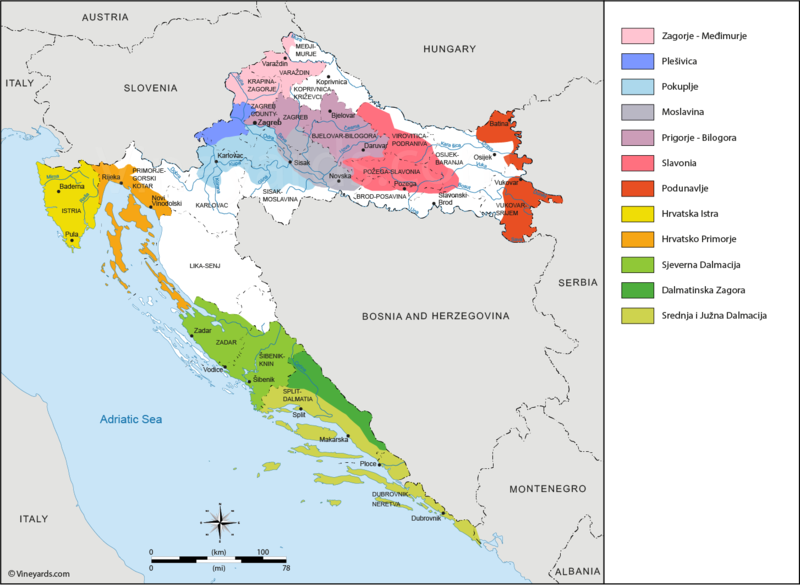 Today Croatia produces around 1 000 000 hl of wine a year from the coastal and the continental wine regions showed on our wine map. The international grape varieties have been gaining ground in the country but indigenous grapes are still very present. These grapes are: Bogdanuša, Bratkovina, Cetinjka Bijela, Debit, Gegić, Graševina, Grk, Kraljevina, Kujundžuša, Kujundžuša, Malvasia Dubrovačka, Maraština, Moslavac, Muškat bijeli, Muškat žuti, Muškat ottonel, Parč (Hvar), Šipelj, Škrlet, Žlahtina, Babić, Borgonja Crna, Drnekuša, Lasina, Ninčuša, Okatac, Plavac Mali, Plavina, Svrdlovina crna. It can be underlind that the croatian grape Crljenak Kaštelanski has been showed to be genetically equivalent to Zinfandel popular in California and Primitivo in Italy.